You will always find me at the heart of every infringement damages assignment we undertake. I know the stakes are high and conduct comprehensive analyses to integrate my knowledge of intellectual property, business practices, financial analysis and the legal rulings that drive damages analyses. Writing a fully documented and supported report that is capable of extensive scrutiny. I believe and my experience has confirmed that a hands-on approach to damages analysis is vital. “A testifying expert needs to have first-hand knowledge and contact with all relevant documents and other key experts. Learning about key aspects of an analysis second-hand from assistants isn’t good enough”. Cost control is another aspect of damages analysis I believe is important. 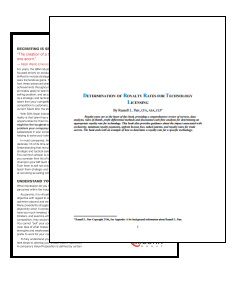 “Too often I have seen the damages reports of other experts include an enormous number of financial exhibits that are never discussed in their repot or presented at part of their testimony. Clearly, a lot of expensive time was spent needlessly”. At IPRA, We know how to conduct an analysis with laser-like focus on the vital elements of each case. 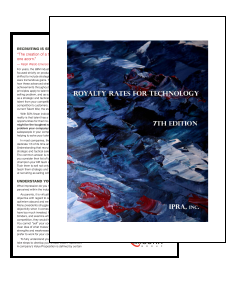 Royalty Rates for Pharmaceuticals & Biotechnology, 8th Edition. The results of my research are also extremely valuable as I conduct a damages analysis. I know from my research exactly what makes sense. My company has conducted valuations and royalty rate studies for pharmaceuticals, semiconductor process and product technology, agricultural formulations, automotive battery technology, biotechnology, camera technology, chemical formulations, communications technology, computer software, cosmetics, consumer trademarks, drug delivery systems, flowers, incinerator feed systems, lasers, medical instrument technology, and motivational book copyrights.